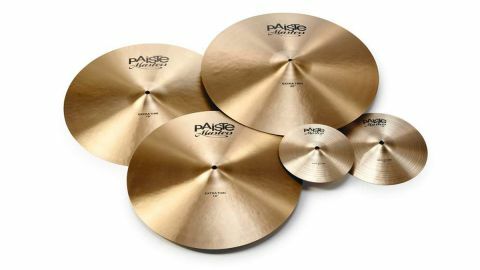 These cymbals are worthy additions to Paiste’s Masters series - they’re beautifully crafted, thoroughly musical, wonderfully subtle and very playable. Such qualities don’t come cheap though and even the smallest of offerings here carries a considerable price tag. Paiste’s Masters series was launched in 2011 and originally consisted of 12 ride cymbals inspired by, and often at the request of, Paiste endorsees. Since then the range has grown to include crashes, hi-hats and a Swish. Amongst the new Masters models announced at the start of 2018 were the Extra Thin multi-function cymbals and Dark splashes on review. In keeping with the Masters theme, the Extra Thins were conceived in response to session giant and Paiste artist Jim Keltner’s “ideas for sound and function”, with the resulting cymbals being “characterised by particular subtlety”. The launch blurb also reveals that Paiste’s Sound Development “created a warm, soft crash that unobtrusively and discreetly embeds itself in soft musical situations” and that the “swift decay supports even delicate ride playing”. Any enquiries regarding the degree of Mr Keltner’s involvement were gently rebuffed; Paiste is notoriously secretive and rarely gives out any information other than that stated in the press release. However, the company did confirm that, for their diameter, the Extra Thins are amongst the thinnest cymbals that Paiste has ever produced, with the Formula 602 Paperthin crashes being the only similarly skinny products in the company’s current catalogue. Available in 18", 19" and 20" diameters the Extra Thins tip the scales at 1,150g, 1,325g and 1,625g respectively, which is very little for cymbals of these diameters. Their supermodel-like waifness is obvious when handling as they flex willingly upon the slightest of touches. Small hammer marks cover the entirety of each Extra Thin while fine lathing is found on both sides. Profiles are fairly flat and the bells are on the modest - if not small - size. The fact that these cymbals are named only as Extra Thins (as opposed to crashes) refers to their perceived intention of covering more than one discipline and being capable of being used as both light rides and hand-played cymbals. As with all Masters cymbals, Extra Thins are cast from CuSn20 (Paiste speak for B20) bronze and handworked through all stages of the manufacturing process. The Dark splashes were not developed with any particular Paiste endorsee but were the result of several requests for Masters splashes. Featuring a mixture of shallow lathing bands and deeper scores the Dark splashes feel gently ridged between thumb and forefinger. Similar in thickness - or lack of it - to the Extra Thins, the Dark splashes are equally malleable in the hand. For an 18" cymbal the smallest of the Extra Thins is definitely on the side of measured and mellow. There’s a softness to the crash and a lushness to the note that suggests that Paiste has met the brief. It’s bright but gentle and the opening peal is bolstered by warm and sympathetic undertones that merge into the smoothest of decays. Taking it into ride territory means playing quite delicately as the wash soon bubbles up when the dynamics are raised. Tickling it with mallets allows the whole crash process to be slowed down and savoured, from the first hint of a note through the rising crescendo to the inevitable cresting and subsequent fade. Meanwhile, the deftest of touches from a bare palm is enough to persuade it to open as well, making it a genuinely hand-friendly cymbal. Moving up to the 19" brings with it a noticeable step down in terms of pitch and an increase in depth and saturation. It’s luxuriously rich and crashes with something akin to elegance, establishing its presence with the sort of unflappable poise usually found in the leading character of a period drama. Tonally, it’s as equally balanced as the 18" and as the swell recedes the note lingers on in a shimmering decay. Taking the stick tip to it brings a surprisingly expansive response; it’s slightly loose but deep and buttery and carries time capably above complex eddies of wash. Progressing to the 20" finds the extra inch bringing with it a change in character. There is a similar step down in pitch and widening of the note but overall this cymbal feels a pinch heavier and a fraction less subtle than the other two diameters… it’s still supremely civilised for a 20" cymbal, though, and crashes beautifully. Riding gives a tighter stick sound over a more controllable wash while the flat of a hand is still enough to bring it to life. Turning to the Dark splashes finds them both springing into action with the sort of urgency you’d expect. There’s a high degree of silveriness and warmth to both and they slip through the air with graceful ease. Personally, we think that anything beyond a 10" diameter is too big for a splash as you are then entering the realm of undersized crashes. Certainly for the Masters series Paiste seems to agree and the pair of Dark splashes keeps things short, sweet and to the point.